The Voskhod-3KV was a Soviet manned spacecraft based closely on the Vostok-3K capsule. It was capable to carry crews of up to three cosmonauts. The basic difference to Vostok was the elimination of the ejector seat to make room for two cosmonauts in spacesuits or three without spacesuits. To soften the landing, a solid fuel retro rocket was incorporated. Also a solid fuel back-up retro rocket system was carried in front of the spherical reentry capsule. 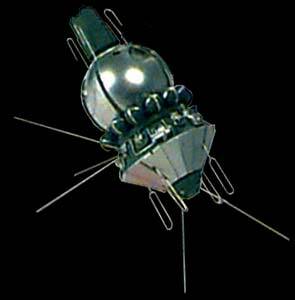 Kosmos 47 was an unmanned flight to test the spacecraft's systems. The 24 hour flight was successful. Voskhod 1 was the first manned flight of a Voskhod spacecraft and the first flight carrying more than one person. The crew of three cosmonauts (Komarov, Feoktistov and Yegorov) did not wear pressure suits due to lack of room. The capsule returned after slightly more than 24 hours. Kosmos 110 was an unmanned long duration flight carrying two dogs (Veterok and Ugolyok). The capsule with the dogs returned safely after 22 days in orbit. It was a test for the cancelled manned long duration flight Voskhod 3. The manned long duration flights Voskhod 3 and 4 with two men crews were cancelled.